We analyze the solutions given by secondary school mathematically gifted students to a collaborative task designed to promote the development of students’ competence of visualization. Each student was provided with two different orthogonal projections of a set of buildings made of cubes and other verbal data, and they were asked to place the buildings on a squared grid. 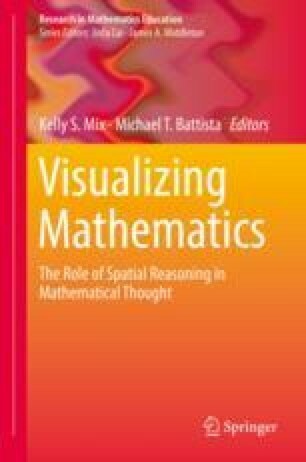 We analyze students’ use of visualization abilities and the complexity of their reasoning. Results show that there is a relation between the objective of students’ actions and the kind of visualization abilities used, and, also, between students’ strategies of solution and the cognitive demand necessary to fulfill them. Finally, we network both analyses to gain insight and look for global conclusions. Ramírez, R. (2012). Habilidades de visualización de los alumnos con talento matemático [visualization abilities of mathematically talented students] (unpublished PhD). Granada, Spain: Universidad de Granada. Retrieved from http://fqm193.ugr.es/produccion-cientifica/tesis/ver_detalles/7461/.